Despite the postponement of the usual reports from Gary Larrabee, we find that there are numerous sources which have reported some amazing developments in recent weeks on the acceleration of progress toward world liberation. Along with the discussion on these reports, we will cover a number of issues from past reports of Larrabee and Kent Dunn. There are many opinions out there about Kent Dunn with regard to his legitimacy and the reliability of his reports. We may note the level of strangeness of many of Kent's reports as well as a number of predictions that he made which did not come true. There is a reason for this, I believe, but before getting to that, let's get to the verifiable developments of recent days. Over the last few weeks, there have been a number of reports coming forward about massive progress toward global liberation. These reports come to us from sources that are highly respected, consistently followed, and constantly trolled by paid online trouble-makers. These are sources that seem to have such a high level of credibility that the waning Cabal establishment perceives them as clear threats, and attempts to smear and defame them in every possible way. One of these sources is Cobra which is a pseudonym that refers to the Compression Breakthrough event. Not long ago, Cobra published a report which detailed the energetic developments that have brought our planet very close to this breakthrough. Here is an excerpt from that article. Drastic action was taken by the Light forces on Saturday at around 11:30 pm Taipei time as the operation code-named "Justice of Maat" was initialized. This operation lasted for about 21 hours and as a consequence, no negative non-physical entity is now safe from removal and departure to the Galactic Central Sun. As a result of all this, clearing of the head of Yaldabaoth entity has been significantly accelerated. Also, the Resistance has communicated that many key physical members of the Cabal "have finally tasted their own medicine." Nothing more can be said about this. To summarize, all negative factions except the Chimera group are now greatly weakened. There are quite few details behind this report. For further information on the Resistance Movement, the Light Forces, the negative Yaldabaoth entity and more, click these links. These developments may seem a bit perplexing with regard to their significance, but we cannot mistake the clearly positive tone of the update. Many of Cobra's reports prior to this one discussed the challenges of the Resistance Movement, the obstacles that remained and various aspects of gradual progress toward liberation. However, the subjects in this excerpt seem to reveal that the final straw has been pulled with regard to the battle against the dark forces. In the past, it has been stated that the positive and negative forces were at somewhat of a stalemate. Due to the agreement that both groups would refrain from attacking one another to some extent as long as no offensive moves were made against certain parties. According to the report, the dark made such an enormous move against certain key Lightworkers that the stalemate ended entirely. It appears that it is now open season on all dark forces. These occurrences seem to directly correlate with our own collective choice to focus upon positive global change, energetic revolution, and planetary rebirth (the collective effects of the Ascension Event). We know from the Maharishi effect that a core group of people in a state of unified, peaceful meditation can actually change weather, matter, and consciousness on a global scale. According to reports, a recent global mediation initiated by Cobra and the 2012 Portal website was able to achieve the critical number of participants necessary to manifest massive positive effects on the planet. This mediation seemed to be followed by numerous monumental reports from a number of independent sources detailing the tangibly positive developments which took place almost immediately after the mediation occurred (February 26, 2017). Let's look at a few. A number of weeks after the mass mediation took place, the well-known author and counselor, James Gilliland, published an article on his website, Eceti.org, about tangible developments in world events. These pertain particularly to American politics and the advancement of numerous plans to liberate American society from the remaining Cabal control. Below is a short excerpt from this article. Portals are opening around the world and others being closed to lower dimensions. The underground bases and Malevolent ET strongholds are being removed. No more interference will be allowed in the awakening and healing process. Gilliland's article has been extremely encouraging to many people even within the first few days of its publishing. Though we must keep our eyes open to the tangible signs of these developments, the independent corroboration to other reports is noteworthy. Along with this report, there have been a number of disclosures regarding the recent briefing between Secret Space Program whistleblower, Corey Goode, and author and head of the Exopolitics organization, Dr. Michael Salla. During this briefing, Goode revealed a number of positive developments within American society. These developments included plans to release technology to the public—technology which will likely resemble that of science fiction movies. The technologies of free energy and advantaged anti-aging methods have reportedly been declassified for possible distribution. Though it is important to seek verification for these developments, it appears that it is only a matter of time before this world changes in some fairly amazing ways. Another positive change we may note is that the state of California has seen record high levels of precipitation since 2011. This extended wet season follows one of the worst droughts which California has seen in history. This was a drought that defied nature and was theorized by many to have been artificially created. As meteorologists commented, there was no known reason why precipitation would not fall in the state of California for such a long duration. It was as though a wall of deadlocked air prevented any oceanic moisture from the Pacific from falling on California at all. This drought lasted for roughly six years and showed every sign of being more than natural misfortune. We have been aware that the Cabal has desired to destroy America in any way they could. We have also heard of the theory that the Californian drought was created and maintained in an attempt to destroy the American food supply, as the majority of U.S. food production comes from Californian farms. Fortunately this plan seems to have been thwarted entirely (though some areas are still experiencing their own dry-spell). It may have even been the Cabal that caused the malfunctioning of the Oroville spillway in frustration for their utter defeat on this front. According to numerous reports, the Cabal is through. They are out of time, out of money, and their influence is all but dead. They have little resources to cause any more trouble than they have at this point, and the secrecy that has long-since protected them is about to end as well. A number of people have expressed doubt about past reports of Kent Dunn, and in many cases, this is understandable. The reports of Kent have ranged from information which seems grounded in provable fact to that which seems far-fetched even for the open-minded. We may remember various reports from Kent about giants waking up and bringing some type of war of Armageddon to the planet. Though ancient stasis beings that are excessively tall have been reported by multiple sources to be presently awakening from their sleep cycles, it has not been reported by anyone of which I am aware that they would ever be allowed to cause any amount of trouble. In fact, these beings have reportedly been imprisoned for some time now. These beings seem to have come to Earth for some unknown purpose and have been the key interest of many secret societies. There were also the reports from Kent which described several days of darkness caused by the mythical planet Nibiru. Fortunately, these events never took place. On these subjects, there are a few thoughts which I would like to cover briefly. There are a number of reasons why I have never subscribed to the idea of Nibiru as believed by some of those within the alternative community. One of these reasons is because we have never seen any evidence that any such planet exists. Though I realize that some have chosen to believe that Planet X is somehow Nibiru, none of these people have bothered to explain how Planet X could jump out of its orbit and swing through a solar system as though it were a foreign body or comet. In other words, a rogue planet and an orbiting planet are two different things. The only attributes which tend to make the story of Nibiru attractive to some people is the fact that this story is popular and is proposed to be ancient. There is also one obscure website which exclusively promotes stories focused on Nibiru and nothing else (though no personal disrespect to those who keep that particular site). This one site seems to be the main source for this type of information, yet there are no references or corroborating sources presented on the website at all. The fact is that neither popularity nor age alone legitimizes a story at all. If I were to start one rumor in high school that was based upon nothing but gossip and nonsense, no amount of time would make that particular rumor true. No matter how hard I worked to spread the rumor, that rumor would never be anything more. It does not matter what the topic of a story is. Neither time nor popularity alone has the ability to make a false story factual. The fact that we have heard Kent Dunn reporting on Nibiru "coming through" the solar system and causing three days of darkness (which never occurred) may leave many people skeptical about the legitimacy of the rest of his reports, and again, this is understandable. However, along with this doubt, we might consider the concept of plausible deniability. When intelligence is disclosed by official and knowledgeable sources, it can be hazardous to attempt to distribute that intel to the public. Those who deliver this type of information tend to become compromised, silenced, or could even be killed by those who are still loyal to the Cabal establishment. This is typically why certain sources are chosen to distribute this sensitive data to the public. These sources are not the people you might expect to hear such information from. They typically do not come from affluent or professional backgrounds. Quite often, these individuals are the last people you might expect to distribute sensitive intelligence, but believe it or not, that is often the point. If a source is largely inaccurate, but is still able to introduce true concepts to the people, this is the ideal source for distributing sensitive information. This is not at all to say that every inaccurate and unprofessional source is reliable. For instance, we are aware of the notion that disclosure is often accomplished through fiction and that sensitive information can be found in the world of entertainment. However, this does not mean that everything we see within entertainment or from questionable sources is factual. There seem to be a number of less-than-accurate sources that are chosen to distribute sensitive information, if only for short periods of time. This may be a reason as to why Kent Dunn was given the initial intelligence on the take-down of the underground bases, the large-scale busts on California pedophilia rings, and other stories which were proven to be significantly accurate. Now we see yet another of Kent's predictions was more than just sensationalist filler. It appears that the report about many of the negative beings leaving the planet may be taking place as we speak. Upon hearing the recent developments from Cobra on March 13, we may be interested to hear the developments which followed. According to other sources independent from those of Cobra, there has been a massive amount of negative groups surrendering and actually requesting to be either rehabilitated to serve the light or to be recycled in the Galactic Central Sun, as Cobra terms the center of the Milky Way. These negative forces have consisted of Draco Reptilians, Archons, and possibly other groups with numbers totaling in the hundreds of thousands. To add, we hear from James Gilliand that certain healing ships which Kent Dunn referred to in past articles do actually exist. Though Dunn stated that these ships were in Antarctica, it does appear that other credible sources believe that some variety of ships will be arriving to assist humanity after the negative ET groups are cleared. These sources believe that from these ships, Earth humanity will actually receive the much-needed healing technology to heal and revitalize our bodies as well as our planet. I do not expect anyone to take such reports for face value, and advise everyone to discern for themselves as to what may occur. Also, it is always a good idea to wait to see what other proven sources might report on these developments. Either way, I would advise the audience to be prepared for many pleasant surprises. 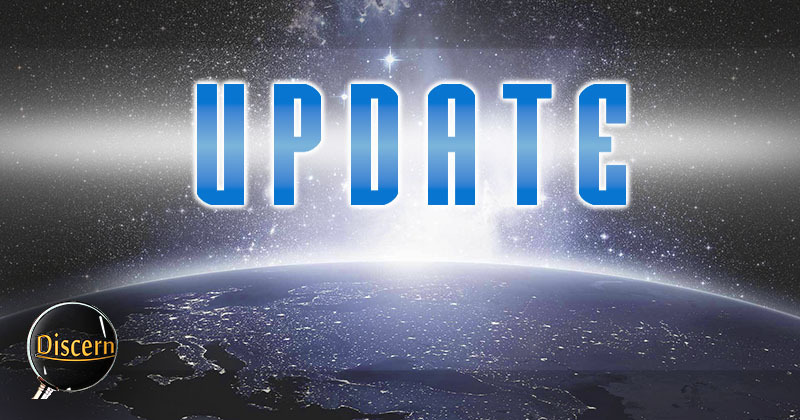 Aside from the off-world events said to be taking place at present, there is plenty of tangible progress for us to take note of, as noted in past updates. We have a number of demonstrations presently taking place and planned for the near future which are focused upon demanding the open disclosure of the Pedogate/Pizzagate investigations. Up until this point, we have been expected to believe that freedom can be responsibly maintained under ridiculously excessive secrecy. Yet history has shown us that this has never been the case. No free society can remain free unless the people are aware of the issues around them which may jeopardize that freedom. These potential issues are and have always been corporate in nature. Those obsessed with money and corporate greed have, for centuries, attempted to deny humanity our unalienable right to life and freedom, and the secrecy of the Pedogate investigations is a prime example of this. The existence of elitist, satanic pedophilia rings is said to be the Achilles heel of the entire Cabal power structure. When this news breaks into the mainstream arena, the Cabal and their entire Illuminati cult will be finished. This is the reason why these protests and demonstration are a key step toward freedom. Much is changing for the positive, and it is up to us to ensure that all of these efforts don't simply drop to the floor. If we simply sit back and wait for great things to happen, and then wonder why they don't, we've missed the entire (overstated, yet seldom acknowledged) point. Naturally, it is only those who actively create positive progress who will tangibly see it take place. In other words, if we choose to sit in anger and depressed hopelessness, change will never happen. If we get off of the couch and make change happen, we will be the first to see it. It is time for each of us to take a long look in the mirror and ask ourselves what we are doing to make the world a better place. That's where the change starts, and if we are active and diligent, and if we do our personal best to make this positive change happen, there will be no end to the tremendous renewal this planet will see. First real upfront report on what is happening. I agree with a lot of it. Thank you for the Kent Dunn info. I felt that he had some good info with some out there info. I just listen and take away what I feel is correct for me. Sobre Nibiru,quiere decir que es falso?.todo es desinformación,hay cabala interesada en asustar a la gente,es lo que entiendo. I am looking forward to a world that is all about peace.